In Delft, they are used to allow locals to use the streets but not regular network traffic. Residents have a garage door opener type radio device and they may pass freely. Other motorists (such as taxis) come up to the intercom come up to a station preceding the bollard and talk to someone to let them through. Another style of this system is a license plate reader before the local access road. 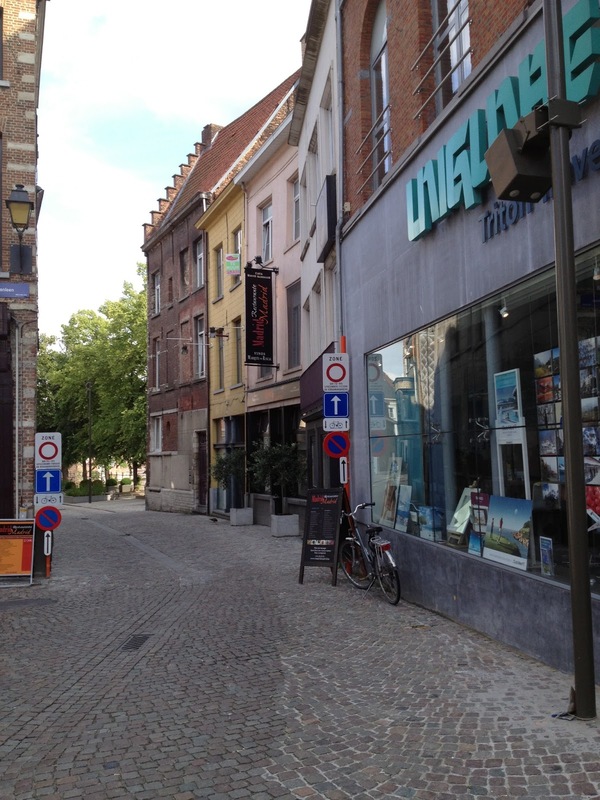 In Mechelen, Belgium some resident roads in the city center have a license plate reader before you enter. Non-residents may not enter between the hours of 1-7pm otherwise the motorist is sent a fine in the mail. See camera in top right of photo. The main drawback of the license plate system are friends unable to visit during these hours. But the benefit of both of these systems is no cut through traffic which would create a quieter traffic environment. Could we do this in Portland? There are streets which could make good candidates for additional traffic calming. 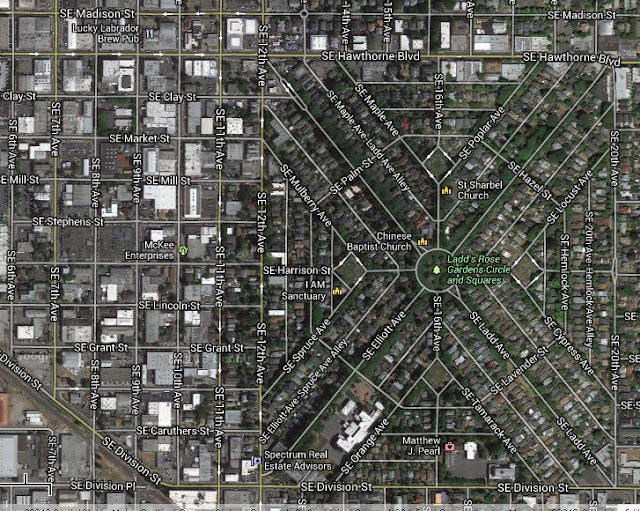 The first one that comes to mind is Ladd Ave, which is the main east-west diagonal street in Ladd's Addition. The bollards could be placed in the NW and SE corners of Ladd Ave. In addition to the benefits of traffic calming, the traffic operations at Division St/Ladd Ave/20th Ave/21st Ave may improve. The intersection previously stated is a 5 legged intersection and requires additional all red clear time needed in the traffic signals cycle length. Bollard would be placed on street in center of photo, below. The bollard improvement would decrease the need for the traffic signal to serve Ladd Ave's vehicle traffic and would only need to serve bicycle and bus traffic. Let's discuss implications of this change. In the a.m. peak hour, there is bicycle traffic and vehicle traffic destined to downtown which uses Ladd Ave. With the new bollards, vehicle traffic would now be turning right onto 20th Ave into bicycle traffic continuing straight into Ladd Ave. To mitigate conflicts, two changes to traffic control could be made. 1) A bicycle signal could be installed with advanced green to put bicyclists in front of vehicles. 2) A bike box at 21st Ave. could be installed to put bicyclists in front of vehicles for visibility. These improvements should mitigate auto-bike turning movement conflicts. Installation of bollards in strategic locations would calm traffic for residents and in this particular case possibly improve traffic operations. why stop there? why not entire bollard playgrounds? What about the turn off before the signal that allows cyclists to use SE Clay Street? Isn't that better than a bike signal because it virtually eliminates delay (until you get to SE 6th). Also, the traffic signal limits the through traffic, what volumes do you think we should be reducing that through movement to. I don't get complaints (except from one neighborhood leader who thought the circle is inaccessible because of the speeds and bicyclists on the circle itself) so I am not sure how much of a problem it is. Bollards seem to be used more in dense urban areas, I am not sure that those locations you're suggesting are the best. I am curious about how much the maintenance of these devices are handled. I imagine they are run into quite a bit. Also curious how much they cost. A.M. peak hour bike traffic does benefit from the turn-off median SE of Ladd/Hawthorne. But p.m. bike traffic does not. In the p.m., I cannot quantify the number of vehicles entering Ladd Ave, but I have observed vehicle traffic 'cutting through' Ladd's Addition from Ladd/Hawthorne to Ladd/Division by biking to the New Seasons at Ladd/Division. Furthermore in the p.m. Peak hour at Ladd/Division on the northwest leg on Ladd Ave, I have observed queues from approximately 5 to 15 vehicles. However, these are my observations and would be interested to know the more precise queues (for bikes as well). Peter, you are right by stating bollards are more frequently used in denser urban environments. To add to that, bollards are used in a mix of commercial/retail businesses. Therefore instead of the mainly north-south approaches I mentioned, perhaps east-west locations would be better candidates for street closures: Clinton Street (25th-26th) and Belmont Street (33rd-35th). Ideally, parking garages would accompany the street closures to address business concerns of lack of parking and resident concern of parking on their block. The street closures would allow businesses more table seating in the street and also increase capacity of patrons. The bollards could be seasonally actuated with sunny days being up (to allow more seating) and rainy days being down as we do live in a rainy environment. 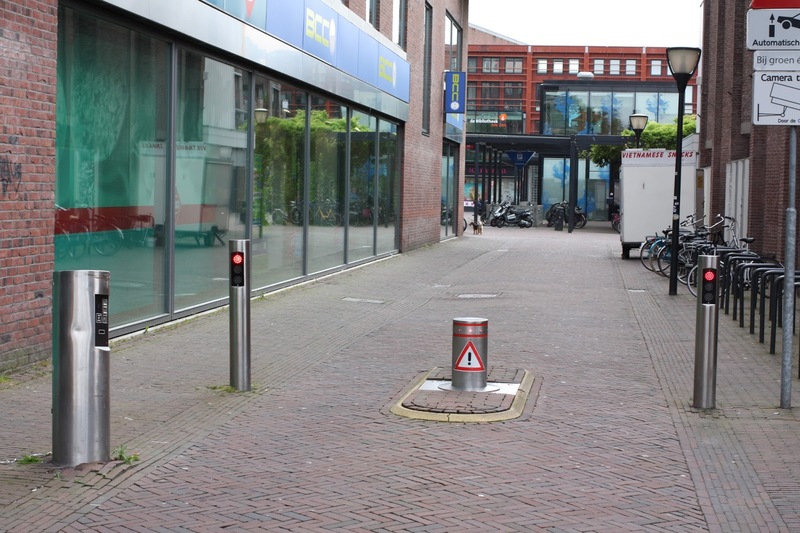 Capital and maintenance costs for bollards? I'll definitely find this out.